← I’m done! Why did I earn my Master’s Degree in Urban Planning? 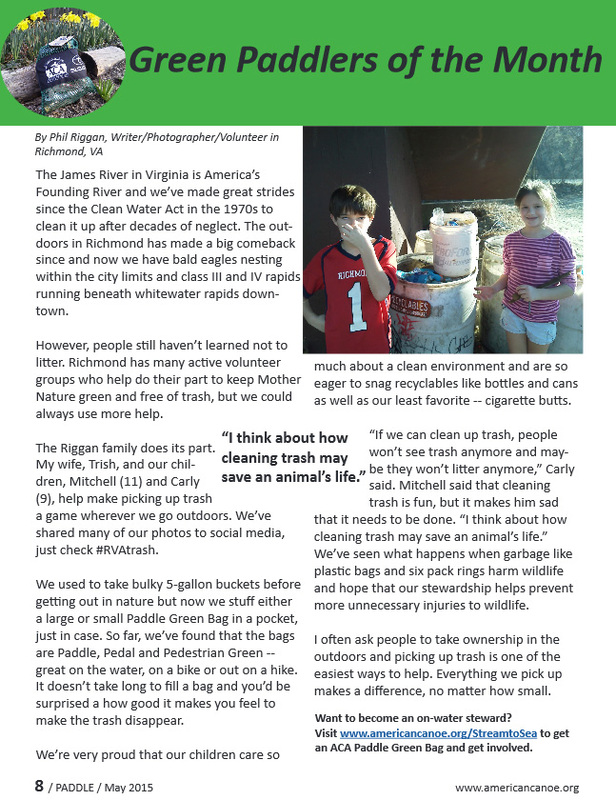 My two children, Mitchell and Carly, were featured in May as the American Canoe Association​‘s Green Paddlers of the Month for all of our efforts cleaning trash when we’re on waterways. We’re very grateful to the ACA for the honor. The national organization, which is based in Fredericksburg, Va., has been very supportive and provided us with paddle green bags that are equipped with tags to allow users to record their collected trash totals that can be reported to the ACA’s Stream to Sea program and even mapped through their Trash Tracker. Adds a little extra fun to the trash collecting game. shared many of our photos to social media, just check #RVAtrash. “If we can clean up trash, people won’t see trash anymore and maybe they won’t litter anymore,” Carly said. Mitchell said that cleaning trash is fun, but it makes him sad that it needs to be done. “I think about how cleaning trash may save an animal’s life.” We’ve seen what happens when garbage like plastic bags and six pack rings harm wildlife and hope that our stewardship helps prevent more unnecessary injuries to wildlife. We didn’t mention in the write-up, but Mitchell and I got about 30 pounds of trash on the James River near Buchanan during a Boy Scout trip and about 15 pounds on the Potomac at Westmoreland State Park, so we’re not just cleaning our home waterways!